My wife and I are looking to take that fat tax check and remodel our kitchen. It's not a very large kitchen but the cost of such a thing will still mount quickly. We're looking at a complete gut to the drywall. We'll be needing new cabinets, countertops and floor tile. I've been looking at a few different cabinet places and some online tile stores, but I'm wondering if any of you have experience with remodeling your house and what vendors you've found to be reasonably priced and of good quality. I can definitely offer advice on this one. Last year when I bought my house I completely gutted my kitchen and redid the cabinets, countertops, appliances, tile, electrical, ect. One thing I'd suggest with all this stuff is get what you want because odds are you'll never change it again or at least not for a long time. What types of countertops are you looking to go with? I went with a black granite. 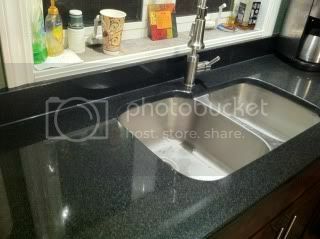 Your granite supplier will typically include the undermount sink and a 3"-4" back splash. Definitely do not go through home depot or those places. Their prices are crazy. I got mine around $50/sqft. Make sure if you go that route that you ask about their seams because you want as few as possible. Also ask about the thickness. Some cheaper places try and skimp and go thin with plywood mounted under. My cabinets I got from a local place where they were Chinese made I believe. I went with a cherry that looks nice. It all depends on your layout and how many cabinets you'd need and if you go with an island and all that jazz. I will say the one place I did find a great deal on handles was lowes. Those ran me about $5/ea. Make sure when you get your cabinets you have someone who knows what they're doing put them in because you want them level and perfect. If you have some more questions, ask away. Always here to help. I'll be heading down this road in the near future, as the kitchen is the last part of my house that we haven't really done anything to. Besides a new fridge, range hood, cabinet hardware & cutting a hole in the wall to the dining room, the kitchen is the same as it was when we bought the house. I'd be interested to see how your experience goes Justin. It's good to see how other people do things. On that note, do you have pictures of your tile Yontsey? We've been thinking about doing something similar in our kitchen. The results were great - I'll post a few pics when I get around to it, but we definitely spent more than we planned, and even with a wonderful and responsible contractor. I'll post more later, but one particular recommendation I would make, rather than black granite countertop, is to go with a New England slate countertop. It has a classic, soft, look. It comes in a few different, natural looking colours (ours is the classic grey-black). It is perhaps the only counter material on which you can put a hot (even sizzling - 500 F) cooking pot without causing any damage (I have done it many, many times). It is very low maintenance and stain free - the only thing we had to do is initially seal it with some standard mineral oil, repeating once about 6 months later. The slate was expensive, but no more so than other high-end countertops - actually it was cheaper than many of the other alternatives we had available around here. You have to get the real thing though, from New England, not the cheap imported slates from India. This too, especially when you start opening up walls. You never know what you could find in there. Just as an idea, I gutted the walls, replaced insulation, wiring, GFI's, cabinets, countertops, appliances, and floor, and did all the work basically on my own or with family help. This ran me about $8000+/-. It adds up quick for sure. Yeah, we did all that too (and moved a structural wall), except not ourselves (I am talent-free for that sort of thing), so it cost us even more. Wow, your kitchens are beautiful. Thanks for the tips. 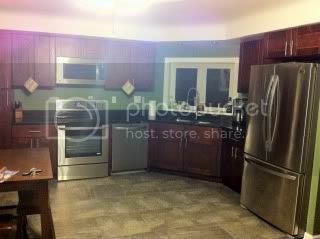 Our kitchen area is pretty small, maybe about half yours Chinney, though we are well aware the costs will add up quick. We've set our budget at $5000 not counting appliances, even though they're being replaced too. Like Yontsey, we'll be doing 95% of the work ourselves so I'm glad to see we're not completely unreasonable in our estimates. Yontsey, did you have to deal with city permits? Chinney, I assume your contractor took care of any you would have needed. Agreed. Nice period integrity maintained throughout; I loved the lights comment at the end too. Great remodel Chinney. No permits needed when I remodeled my house. Chinney, if you don't mind me asking, about how much does New England Slate run a square foot? That slate is pretty sweet looking. But now looking at all the other detail pictures I couldn't see on my phone, I realize that your kitchen is about 4x the size of mine. Haha. Regardless, it's beautiful. Yontsey, your flooring is pretty sweet. 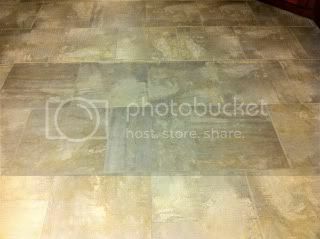 Is that a porcelain tile or is it a slate? How much time would you say each of your remodels took? It's porcelain. I can't really give you an exact date, because I did my whole house at once and that took 3 months. Realistically, I could say maybe a month? It's more about being able to get the items you bought delivered and scheduled. For example, my granite took probably 2-3 weeks from the time I ordered it til it was installed, but in order for that to happen, I had to have all the wiring and drywall done, tiling, and cabinets. I would say a month give or take is a safe call. Answering a few questions and comments…Thanks, we were very happy with the way the kitchen turned out…even as we were astounded by the mounting costs. If you are doing it yourselves though, it will be a lot less. Looking back, the total cost of the materials was not that high – it was the labour, including the professional design services (which in our case were worthwhile, given the extent of what had to be done). That does, however, suggest one thing in my mind: use high quality materials whenever you can. Providing you don’t go for the outlandish stuff, the ‘good’ materials often do not cost that much more than the cheap stuff if you are careful how you source it. Since the labour is the big element, you might as well splurge a bit on the materials if you can. Keep in mind as well that cheap materials often don’t hold up very well, so unless you are doing the reno as a temporary thing (not staying in the house, for example), better materials are going to cost less in the long run, and often even in the medium run. The cost of the slate counter is a good example. I don’t recall the cost per square foot (sorry), but we spent some time working with the designer/contractor to source it (we ended up doing some of the research online ourselves) and ended up paying less than most of the other finishes originally suggested, such as granite. It was still pretty expensive, but perhaps less so because it was ‘almost’ local, given our proximity to New England. The kitchen island is a further example. We bought that thing at an antique show a few years ago with a plan on using it in our eventual kitchen reno. It was originally a 19th century shop counter from somewhere in southern Ontario. It is solid maple and sturdy as anything. But it cost us less – much less – than a new particle-board kitchen island of the same size that is what you will get at a standard supplier. Actually, the big costs that we encountered were due to the difficulty of the construction. There were surprises. Cast-iron pipes (for our old radiant heating system) were in the ‘wrong’ location behind walls, requiring some surprisingly difficult and expensive re-routing to allow for the rest of the work in that area to be completed. A structural wall move exposed weaknesses in the sub-floor structural wood due to a furnace fire that happened maybe 80 years ago and that was never properly remedied and that required considerable work in the basement to fix. There was a realization half-way through that our existing electrical panel was just not going to accommodate the new kitchen wiring, requiring a replacement panel, forcing still additional electrical work to accommodate modern electrical code requirements. Permits were required, including special engineering reports and sign-offs due to the structural issues. The bulk of the reno took about 3.5 months (with a couple of additional months to accommodate some final finishing items) and was kind of hellish at some points, despite all the great work by the people we hired. It was worthwhile though. I just spent the last 14 months having my house torn down to studs and foundation, then rebuilt. Hope to never do it again. I bought Ubatuba engineered granite, which cost a little over 5500 installed. This included a single and a double bathroom vanity (which I posted in the creative endevours forum somewhere around New Year's since I added a bunch of fixtures and was happy with the result). I used Sanford & Hawley for my cabinets and granite. They were very easy to work with and no one could beat their price for granite. bassplayinMacFiend, your kitchen looks very similar to how we envision ours: dark counter tops, black appliances, light cabinets and walls. Is Sanford & Hawley a local vendor? A quick google came up with locations in CT, but not much else. I guess they're local then. I'd have a hard time thinking that there would be a national cabinet chain other then the typicals (Home Depot, Lowes, ect). All the places I know and deal with in northeast Ohio that do them are locally owned companies. The love's parents just remodeled their kitchen and got the cabinetry/counters from Ikea. It looks very, very nice and not "Ikea-y" at all. i hate dark kitchens. The motivation to have stained wood from floor to ceiling is odd. It keeps things darker than they need to. That said, I really like Chinney's kitchen -- it is light and airy and you can tell if the cabinetry was stained wood, the entire thing would be dungeon like. Is that a subtle knock on my kitchen? I was going to start the post: This is not meant to be an insult to the kitchens posted here. My parents have a massive cave of a kitchen. Dark floors, dark cabinets, horrible mid-1980s flower wall paper; blue laminated particle board counters; etc. It needs gutting and re thinking. Mine's not actually that bad. I have nice resesed lighting over the sink and the windows there and then the view from where I took the picture is wide open going into the living room with a large window. Actually a light vs. dark look was a big factor in our design. While there are some beautiful kitchens out there that are all naturally dark wood or stained or painted dark wood, top to bottom, our own preference was for a lighter look, at least on top. Actually, my wife might have gone even lighter for some of the elements of our scheme. I appreciate the designs of the other kitchens in this thread, but I do like a bit of light look myself. Re a couple of comments on size, the panorama pics on our designer’s website appear to be taken with an extreme wide angle lens (just a shade less than fisheye), and make our kitchen appear bigger than it actually is. In reality, we did not have a huge space to work with even with moving part of a wall. It is an extremely efficient space though, allowing two and even more people to work in it at the same time. Yesterday we went to Lowes to get our first estimate (Lowes is literally right around the corner). It was a little more than I was expecting it to be considering the size of the kitchen, even with us doing the install. Today I started looking up designers/cabinet people here locally. It appears that all the local options, at least the ones I've seen so far, are designers and vendors for national cabinet brands. I don't think that's a bad thing, but I'm wondering what kind of price differences there will be between them. I do like that a number of the local places I've been looking at are family owned and have been in business for over 25 years. I also liked that one of the sites proclaimed that there's no reason a home store, like Expo or Lowes, would ever be able to beat their prices. A lot of times you can go into the family owned places and if you are paying in cash, you can get them to work deals.